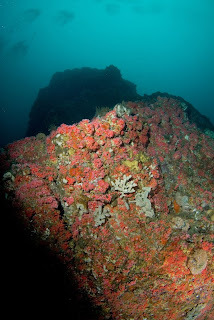 A few months ago, we did a dive at a spot on the deep deep shale which we call Kawika's Garden. 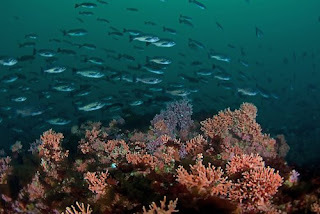 We saw a lot of interesting rockfish there, so we've been wanting to go back for a while, to see if they are a fixture there. We finally put together a trip for Saturday afternoon to go back out there. As it turned out, the conditions looked crazy good, and it seemed like it would almost be a waste to dive the shale in these conditions. Rob predicted on the way down that there may be a mutiny. When we got to the dock, Jim mentioned that there appeared to be some sort of sailboat race going on in the vicinity of the spot we wanted to dive, so this may be a problem. I am honestly not sure if this "sailboat race" really existed, or he was giving us an out if we wanted to bail to a more exciting spot :-). We all agreed that if the "race" prevented us from diving there, we should head south. So that's what we did. After what I imagine was some wheelhouse negotiation between Rob, Jim, and Beto, we decided on Pinnacle Point Wall, which is just outside the Lobos boundary, near the point. I hadn't been to this site before, but I had eyed it on the bathymetry and it was on our short list for sites to go to on our Fridays with Phil (which have been in short supply lately). Usually on the tech boats, people sign up in teams, but as we were having trouble early on even getting enough people to make the boat a go, there were a bunch of singletons in the mix. So we took the opportunity to mix things up a bit. I dove with Clinton and Karl (my first tech dive without Rob, woohoo!). When we got to the site, Jim told us there seemed to be a bit of a current pushing us west. We hopped in and kicked to the line (during which I could feel the current), and then headed down the line. It was, again, a slow descent (though not nearly as bad as Wednesday), but eventually we made it down, and the viz was awesome. 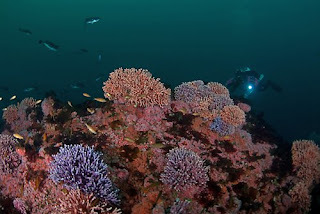 The water was so blue, and the pink Corynactis really lit up the reef. There were also a lot of elephant ears that contributed to the whole reef looking very bright. Since the original plan had been to look at fishies in the bay, Rob and Clinton had both packed macro. Oh well. It would have been a great day for wide angle, but it was a great day for macro too! We got right to work looking around for some little critters. The first thing I noticed was something Doto-like on some hydroids. They were all over the place, and bigger than I thought Doto's were supposed to be. I have only seen one (a Doto amyra) once before, which Clinton found. So I really wasn't sure of what they were, but I pointed them out to Clinton, he seemed excited, and then I moved along. Turns out they were Doto amyra too. 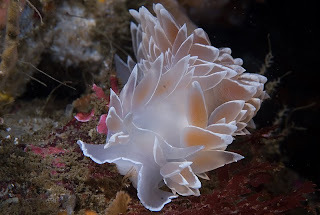 Other than that, I spotted a bunch of Diaphorodoris lirulatocauda. Then we ran into Rob's team, and Rob pointed out a couple of Cuthona divae which Matt had found. Everyone took a turn either taking pics or oohing and ahhhing -- they are so pretty! That was pretty much it for exciting finds. There were also tons of Hermissendas with bright red tips, which I really like. All of the pictures (from both Clinton and Rob) are here. Also, Beto posted an incredible video from the first dive, although I do a double take every time I see the scene where Susan is swimming (yes swimming, not scooting) towards the camera :) The pictures in this post are by Rob, even though I didn't dive with him -- he had a mini temper tantrum when I told him I was going to use Clinton's pics... how adorable. On Wednesday, we took the day off for a birthday dive, and coerced Matt into coming with us. The M/V Phil Sammet was not available due to some BBC otter harassment, but Jim (and his able mate Ed) were nice enough to take us out on the Escapade for a dive. It was Matt's first post-T1 tech dive, woohoo! 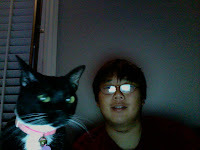 Not since Rob and Kevin finished T1 have I seen anyone argue with such conviction about the placement of a single minute of deco -- Matt is clearly an honorary Kitty! Seas were incredibly calm, so we could basically go wherever. We discussed Mt. Chamberlain, but decided to try a spot we hadn't been to before, and went to Forgotten Pinnacle, which is just off Cypress Point. It is a pinnacle that ranges from about 100' to about 170'. One side (the east-ish side) has a more dramatic drop-off than the other. The water was dead calm on the ride down -- so calm, that I didn't even notice it when we rounded the point. When we got to the site, we got geared up pretty leisurely, since it was so calm. We hopped into the water, and when we got to the line, it was like completely vertical. We headed down which took a looong time (I was a bit congested from the tail end of a cold I picked up in Boston), but Rob and Matt were very patient (or at least Matt was). When we were at around 80', a sea lion zipped past us. We finally made it down to 100', and then I started to swim us in one direction (counterclockwise), but Rob suggested going the other way. So we did, to a little splinter pinnacle off to the west of the main pinnacle. It was kind of tall and skinny with a lot of Corynactis growing on it. I pretty quickly picked a spot to linger on, since by that point it had taken us so long to get down and get going, and I wanted to find a spot for Rob to take some pictures. In hindsight, it may have been better to scout a bit more before picking a spot. 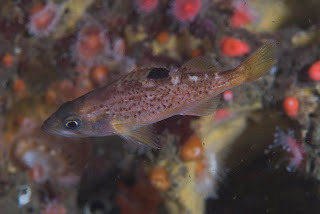 Anyway, the highlight of that spot was definitely all of the juvenile rockfish. There was a big group (maybe 100) hanging out off of the pinnacle, and as I was looking at the pinnacle, I noticed that the reef was littered with more little juvies just hanging out on the rock. I am fairly sure these were widow rockfish (thanks to Tom Laidig for helping to train me in juvie rockfish ID). 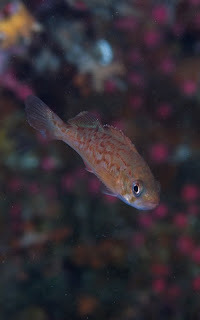 I also saw several tiny rosies, probably the smallest I have ever seen, which for some reason are, to me, the most adorable of the juvie rockfish that we see (with perhaps the exception of this blue-eyed beauty). And I saw at least one mystery juvie which I thought might be an olive, but Tom says is probably a yellowtail, based on depth. In addition, there was a big school of blues and olives (adults) hanging off of the pinnacle. When we got back on the boat, Jim said that some of the whale boats had reported seeing Dahl's porpoises in the bay, so we headed up there to take a look, eating cupcakes on the way. 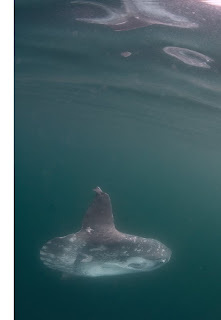 We never did find them, but we came across a big mola basking on the surface. We hung around with it for a while, and it didn't seem bothered, so Rob decided to jump in and try to get some shots. I jumped in too, but the mola quickly decided it didn't want its picture taken, and demonstrated to us just how quickly it could really swim. Jim got a nice surface shot of it though. After that we motored around some more and eventually found a big pod of Risso's dolphins with a few common Pacific dolphins mixed in. I think Jim said he saw some Northern right whale dolphins too, but I didn't see them. While we were having fun with the dolphins, we did briefly see a humpback whale kind of far off. After quite a long sightseeing cruise in the bay, we headed back in. Thanks to Jim and Ed for a great day out on the water! We were in Boston for a wedding, and decided to finally do some diving. We usually go to Boston a couple times a year, but we never get around to diving, because the gear (drysuit) schlep doesn't seem worthwhile for one day of diving. But we finally decided to do it. The gear schlep, however, did not involve Rob's camera, so no pictures for this one. 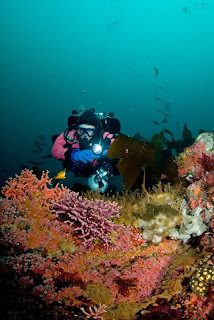 For me, "northeast wreck diving" conjures up images of hard coreness which I do not possess. So, I thought I'd put that in the title to trick some people into reading the post. 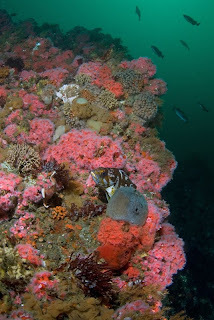 In truth, what we did was "northeast wreck diving" in its softest form. We dove the stern of the Chester A. Poling, an oil tanker that broke apart on the surface before going down off of Cape Ann. The stern sank in about 100 feet of water, very close to the Gloucester Harbor, while the bow is in like 190'. Now Rob is obsessed with diving the bow "next time" (surprise surprise). 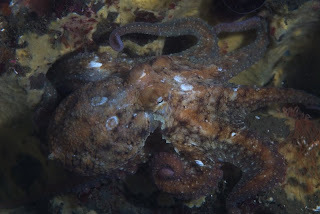 We dove with Cape Ann Divers, and did two dives on the Poling. The wreck is like right outside of the breakwater at the entrance to Gloucester Harbor, but the Harbor is long (check out this aerial shot) so it was still about a 20 minute ride out to the site. The water was calm when we got to the site, it seemed like the boat was hardly moving while we geared up. We managed to flop into the water first, and scurried down the line, with surprisingly not bad viz. I was worried it would be really bad, like hard to keep track of your buddy bad, based on what I'd read about viz around there. It was probably around 20 or 25 feet. The mooring line was at the stern, and after we dropped there, we dropped alongside the back and swim around the port side. I noticed one or two Cadlinas on the wreck. There were also some Metridium senile, and some small and medium-sized fish (don't know what they were). 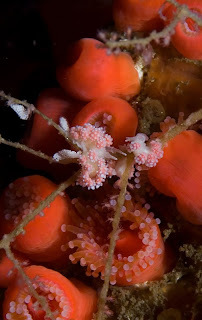 And various sponges, tunicates, and hydroids. As we came to the break, for whatever reason, it seemed like the encrusting life really picked up. We came to the break and swam around it. It was a big cavernous area and you could see in, but with our lame little Scout lights, we couldn't see much. This dive definitely called for real lights, but they didn't make it into the luggage. 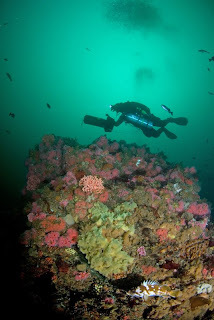 For the second dive, we decided to swim along the starboard side back to the break, and then come up over the top and check out the deck some more. Since we had pretty much seen the side of the ship, we spread out from it a little bit and were looking at the debris on the bottom nearby. On this dive I realized there were Cadlinas everywhere. I also found a tiny little slug in a hydroid, which I am pretty sure was some kind of Eubranchus (there are a couple of different species in that area though, so I don't know which it is). 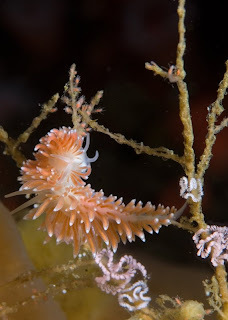 A little later Rob found another little slug, some sort aeolid, on a hydroid. It reminded me of a tiny Hermissenda, because its tips were a different color than the rest of the cerata so they sort of looked like they glowed at the tips. I have no clue what it was. We also shined our lights into some of the holes along the wreck; it seemed like there was a lot of growth in there, but with our tiny lights, we couldn't see it very well. At some point before we got to the break, both of our lights died, boohoo. One thing that we did find strange about the Boston diving scene was that Nitrox does not seem to be nearly as common as it is out here. We had to go out of our way to find a shop that pumps 32%. Everyone else on the boat was diving air; to me, it seems barely worth it to pay for a boat charter so you can do two 20-minute dives. 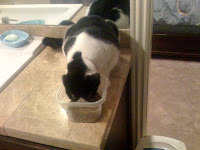 While we were in Boston, the kitties spent some quality time with Ted, who checked in on them and replenished the kibble stock. He sent me some iPhone pictures of them each doing what they do best. The day before our trip to Big Sur Banks, there were reports of significant fog in Carmel Bay :( The NOAA forecast also mentioned "patchy dense fog" for the day of the trip. Well, we had to go down and see for ourselves. Basically everything past Cypress Point was engulfed in fog. It was actually kind of creepy. I had no idea where we were for basically the entire trip beyond that, since there were no landmarks to be seen. Around Yankee Point (or so I am told), we powwow'd to discuss whether we should continue on or head back to the fogless north. We decided to continue on and see if things improved. We got out to the banks, and things had not improved. Clinton suggested we head landward and check out Midway Pinnacle (which, as you may have guessed, is midway between Big Sur Banks and Point Sur). It was at least as foggy there, so we continued in, and then headed north along the coast, hoping for a break in the fog somewhere. As we approached Las Piedras Wall, it suddenly cleared, and there was an area that was surprisingly free of fog for a decent distance. So we decided to do a dive there, and see how things looked after that. While the second group was in the water, Phil told us that we would go back and check out Sur19 after their dive -- woohoo! After collecting the divers, we headed out there, and our group got geared up on the way. We wanted to hop right in as soon as we got there, since the schedule was tight at this point. We got there, and after a pretty significant delay in getting anchored (during which we were all wilting in the heat, fully geared up), we finally hopped in. I swam back to the swimstep to get my scooter, and I really had to hold onto the step because of the current. I got my scooter, and noticed that on the surface at least, scootering on 3 (of 5 speeds) was not cutting it without a little kicking. On 5, my little X could take it though. We got to the line, but I couldn't really see the line in the water -- the water was super foggy. After a little confusion getting started down the line, we all found each other on the line about about 10', and headed down. I was actually staying in touch contact on the line as we scooted down and we were all very tightly packed on the line, because the water was so hazy (not chunky at all, just very foggy looking). 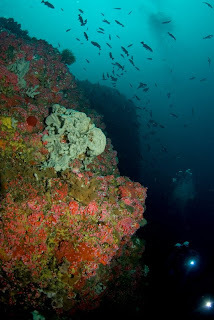 Then suddenly below 30' the viz became incredible -- suddenly I could see so far! We got down to the structure, and could see the pinnacle off to our left. The viz was really unbelievable -- if I had to give it a number, I would say 80-ish, but Rob says it is "in the equivalence class of immeasurable" which I believe is geek for "you can see as far as you want to see". The ride back was super calm, I even managed to sleep for part of it! Rob had some sort of camera mishap (silly locking buttons) so he wasn't too happy with his pictures from the second dive. I guess we'll just have to go back again! 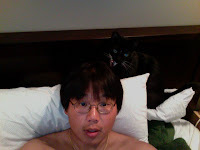 Day 2... Pepper watches Rob work on his laptop. 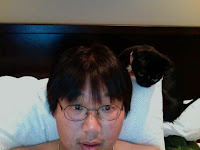 Day 4... Pepper watches Rob work on his laptop. 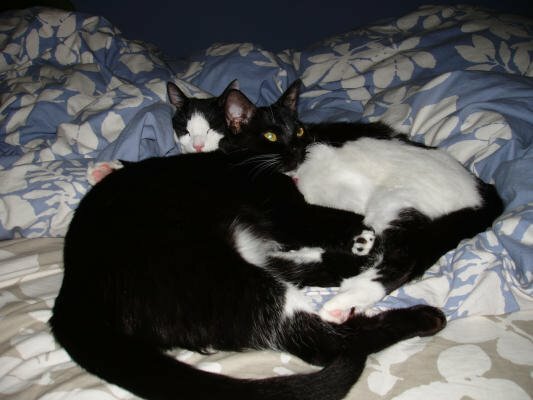 They were hunkered down in the bedroom with the AC on. Day 4... Pepper takes an active interest in Rob's work. He was programming a robotic squirrel. Day 5... Even Pepper needs a little break from Rob's work now and then. 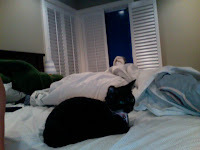 Rob refused to send me pictures of Oreo, because he is mean. 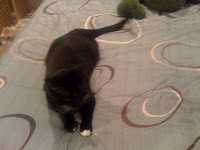 However, my sister did send me this pic, which she took the day that I left. I returned home from New Zealand on Sunday afternoon, and we had a Lobos reservation and tentative plans to dive on Monday -- after a weekend of diving a poodle jacket (or is it a stab jacket? Clinton explained the difference to Rob...) I figured it would be good to figure out how to use my usual rig, not to mention my scooter, before the next Big Sur trip. However, given my general grogginess after the not-quite-restful 13 hour flight, we decided to make a game day decision about diving. So I was afforded the unusual luxury of waking up when I wanted to on dive day. The result was that we pulled into Lobos around 12:30, by which time we were dodging calls from dive buddies wanting to know if we were ready for a post-dive lunch :) The downside of arriving at 12:30 is that you aren't guaranteed to get a good parking spot at Whaler's Cove, but we got lucky and got a pretty decent spot anyway. We saw Dionna and Harry, who were getting out as we pulled in. We also ran into Paul Lee who was free-diving, who I haven't seen in ages. It was nice to see him, although as it turned out, we ran into him as we were walking into the water, and with the weight of my gear weighing me down, I had to cut the chit chat short. Given our shortened day, we decided to do a single dive, scootering out to Beto's and hanging out there for a while, looking for macro subjects. We scootered out to the end, hung out there for a while, and then slowly worked our way back towards the shallower end. The first thing I noticed as I looked around for itty bitty critters, was that there were a lot of Diaphorodoris lirulatocauda -- not too surprising, since I have been seeing a lot of them in general lately. I also saw a couple of Aegires -- I guess it was the day for small white slugs. Over at the deep end, we also ran into a couple of young rosies. We eventually made it back to maybe halfway up the reef. There was a small band of juvenile blues hanging out there, as well as a couple of Spanish shawls and a nice Dirona. It was a sort of peachy color, which I found pretty. Eventually it came to be that time of the dive where we had to wrap things up and head in. 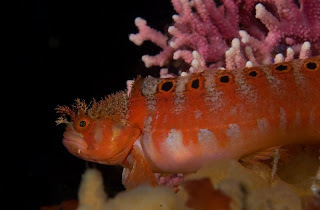 As Rob was stowing his camera, I was scanning the reef and did a double take as I came across a warbonnet sitting out in the open. I didn't want to make any sudden light movements that would scare it, but at the same time, I wanted to get Rob's attention. Eventually I did, and we agreed to push the bottom time an extra 5 minutes. He whipped out his camera and took some shots. After 5 minutes, we really needed to go, so Rob sadly stowed his camera and we headed in. I could tell he could have spent a lot more time with the warbonnet.